March 14th, 2019 by Robert J. Weather can be extremely harsh in New England: one month we may have scorching hot weather and the next we could have a nor’easter that dumps inches of snow upon us. This was such a problem that last year, a national pizza chain launched a PR campaign and took it upon themselves to fix our pothole-riddled roads. Unfortunately, we are not the only ones that face that effects of this wide array of weather. A five minute drive proves that our roads, and ultimately our cars, bare the brunt of these brutal cycles in our climate. With that being said, it is imperative to have a vehicle that has the proper suspension in order to keep you comfortable and safe year-round. 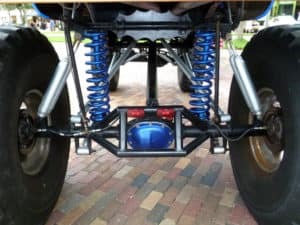 Why Is Your Truck Suspension So Important? A suspension system is a combination of springs, shock absorbers, linkages and other components that connect an automobile to its wheels. Your suspension assists in the braking of your car, the absorption of vibrations, the effects of gravitation, your cars handling and the impact of other forces from driving on the road. Springs are a crucial part of your suspension system. When irregularities arise in the surface of the road, the springs on your car allow it to compensate and adjust for reduced bounce and a smoother ride. Additionally, springs allow your car to support excess weight without sagging and also keeps your car at a predetermined height. Without springs, cars would be dragging on the ground and incapable of adapting to various road conditions, making for an unbearable ride! Thankfully, we do have this incredible automotive invention and over the years several variations of spring systems have arisen to meet the demands of today’s driver. If you have a vehicle that was made before 1970, chances are it has leaf springs! Leaf springs were first invented in France in the 18th century to improve the ride of horse-drawn carriages. More advanced variations of this suspension style were created, but the designs were still simple enough to make it the most popular choice of spring for decades. In general, a leaf spring is composed of multiple layers of metal, called leaves, that are bent into an arc (elliptical springs). The arc and friction from the leaves rubbing against each other allow the vehicle to absorb bumps and hold the weight of the vehicle. 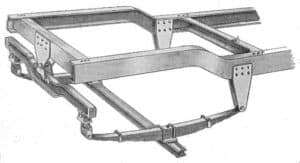 Leaf springs are attached to the body or frame of the car at each end, while the wheel or axle assembly is fixed in the middle of the spring. Due to their simpler design and ability to handle heavy loads, leaf springs have been a popular option for rear wheel drive vehicles, particularly trucks. With the advent of front wheel drive cars in the 1970’s, leaf springs fell out of popularity to coil springs, which are the most popular and used today. The automotive industry underwent a major change in the 1970’s: Front wheel drive became the new standard for drivetrains! With this industry wide change, a new style of spring was required for most suspensions. Although the leaf spring had already been around for several centuries, it really came to light during this period. Coil springs , or helical springs, are a heavy duty torsion bar that has been wrapped around an axis. This design allows the spring to compress and expand, meaning the tires can absorb a greater amount of motion. Compared to leaf springs, coils cannot bear as much vehicle weight. However, everyday drivers of cars do not need the extra durability that leaf springs have to offer. Just like the transition from leaf to coil springs, the auto industry is seeing yet another change to suspension technology. Dodge and Ram are acting as industry impetus when it comes to air springs and their implementation in today’s market. Like most new technology, air springs actually date back a lot further than we may think. 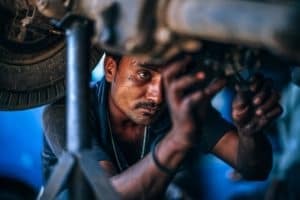 First invented in the early 1900’s, air springs were produced and featured in a handful of luxury automobiles and heavy duty equipment such as military and construction vehicles. Essentially, air springs are tough rubber and plastic bags that can be inflated and deflated in order to adjust the vehicles height. These bags use electronic controls, particularly air sensors and compressors, to modify the suspension depending on the needs of the automobile at the time. There are several advantages that air springs have over traditional leaf and spring coils. Air springs give you the ability to adjust your ride quickly and easily with little to no need for tools. Air springs also have the ability to vary load capacity and can adjust the handling of the vehicle to different situations. Today’s air springs come with self-leveling functionality, as well as raising and lowering modes that help provide the unbelievable ride quality we are able to experience today. The suspension of your car not only guarantees that you have a comfortable ride: it also ensures that you stay safe while driving despite whatever road conditions you may face. Dodge and Ram introduced air springs into a portion of their lineup several years ago and are working to increase the safety, durability and function of the springs in their suspension systems! To view our inventory of Ram pickups with air, coil and spring suspensions continue scrolling down! 2015 Ram 1500 4D Extended Cab Express EXPRESS, 5.7L HEMI, 20 INCH ALLOYS, 8 SPEED AUTOMATIC, CLASS 4 HITCH, CERTIFIED, 4WD. FCA US Certified Pre-Owned Details: * Vehicle History * Includes First Day Rental, Car Rental Allowance, and Trip Interruption Benefits * Limited Warranty: 3 Month/3,000 Mile (whichever comes first) after new car warranty expires or from certified purchase date * Transferable Warranty * Warranty Deductible: $100 * Powertrain Limited Warranty: 84 Month/100,000 Mile (whichever comes first) from original in-service date * 125 Point Inspection * Roadside Assistance Awards: * Green Car Journal 2015 Green Truck of the Year * 2015 KBB.com 15 Best Family Cars Based on 2017 EPA mileage ratings. Use for comparison purposes only. Your mileage will vary depending on how you drive and maintain your vehicle, driving conditions and other factors. Reviews: * Massive interior room; low step-in height; available fuel-efficient diesel engine. Source: Edmunds PLEASE READ CAREFULLY. We use various computer software sources to decode the vehicle identification number of our displayed vehicles. This software helps us list the equipment of the vehicles we have online for sale. Although usually pretty accurate, there are sometimes errors. So please look over the equipment very carefully when you inspect our vehicles. We care very much about our customers and don’t want to have any misunderstandings! Also our vehicles are priced using equally sophisticated software and rely on many factors to help us place our vehicles with our best price first. Specific equipment can be a factor, but not the only factor of pricing.